Wow, gluten free baking is expensive! I opted to purchase Bob's Red Mill Gluten Free All Purpose Flour to save money, but I'm not certain if I did. His blend includes garbanzo bean, tapioca, sorghum, and fava bean flours, along with potato starch. If I would of purchased all of these flours separately it would of easily cost me about $25, but I ended up spending that anyway because I purchased a $12 bag of xanthan gum. Oh well, live and learn, but this is one expensive tomato tart! I actually skimped on the other ingredients for the tart because it was getting to the ridiculous stage. I just don't know that much about gluten free baking. Perhaps I could of skipped the xanthan gum all together or purchased guar gum instead, which is a lot cheaper. So how did the tart crust turn out? Well, I'm not sure actually, because I've never eaten a gluten free pie or tart crust before. The texture was more on the sandy side, not flaky which is what I'm used to. The bottom of the tart held together nicely and did not get soggy from the tomatoes. However, the sides were a bit fragile and I had to be careful cutting the tart so that it did not crumble under the pressure of the knife. Also, the crust didn't have a lot of flavor; however, I could definitely taste a hint of garbanzo bean, which was a bit weird. Perhaps it's the recipe I used, or I didn't use enough butter, or xanthan gum--I'm just not certain. Anyway, I'm going to make the tart again so if anyone has any suggestions, I'm definitely listening. Dice butter and place in the freezer for about 15 minutes before using. Place flour, xanthan gum and kosher salt in a food processor and pulse until combined. Add diced chilled butter and pulse until the size of small peas or oatmeal in texture. In a small bowl, whisk together ground flax and 3 tbsp water and add to food processor and pulse again. Add 1 tbsp of ice water and pulse a couple of times again and then test to see if dough will form into a ball. If too dry or sandy add additional tbsp ice water and pulse. Remove dough and knead into a ball and form into a flat disk. 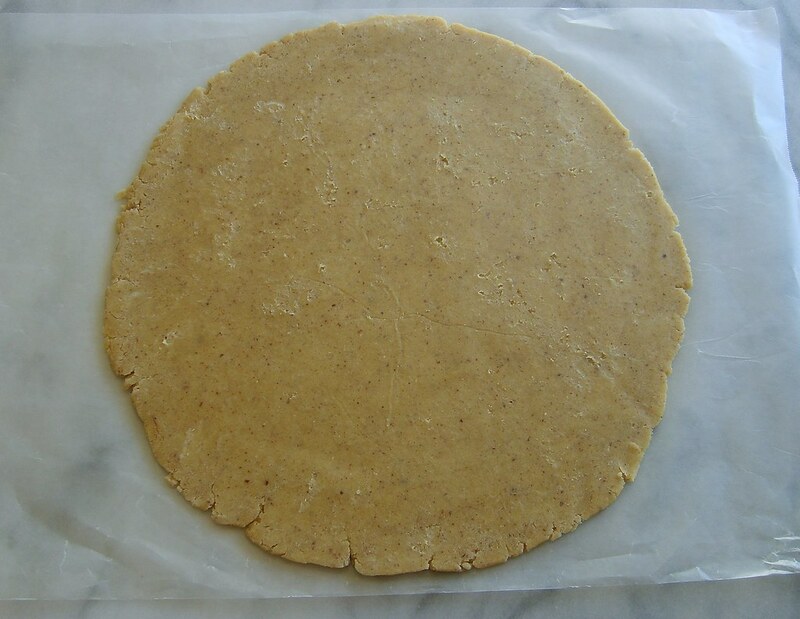 Roll out dough between two pieces of wax paper to about 1/8-1/4" thick and about 2" larger in size then your tart pan. Transfer dough to tart pan and press dough along bottom and sides of pan, removing excess around the edges. Prick bottom several times with the prongs of a fork. Freeze tart pan for about 15 minutes before baking. Place tart on a sheet pan in the middle of the oven and blind bake (cover with foil and baking beans) for 10-15 minutes. Remove foil and baking beans and bake for another 10-15 minutes until crust is firm and starting to pull away from the sides of the pan. Let cool for about 10-15 minutes before adding tomatoes. Note: For my tart, I did not use the basil pesto or Daiya cheese. As I said above, it was getting too expensive. When I make it again, I will definitely add these components to the tart. 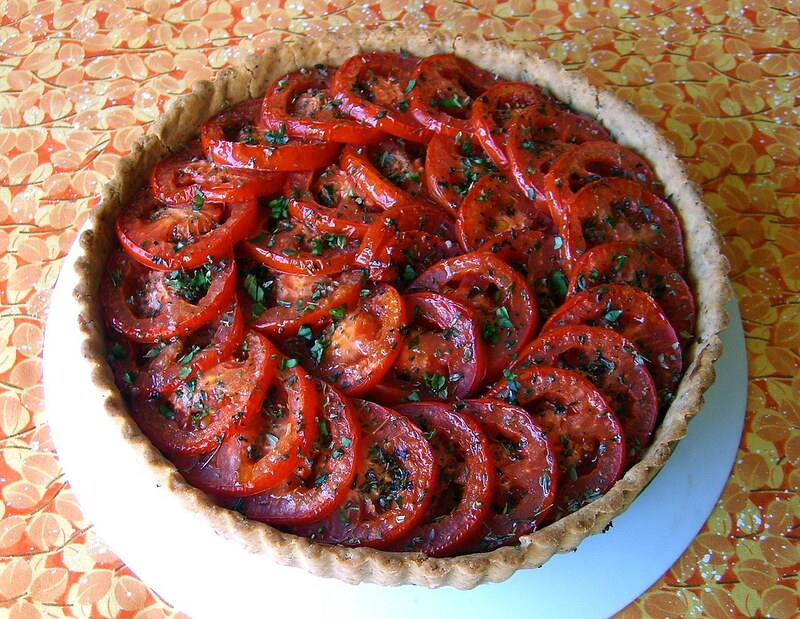 Also, this tart would work better in a square tart pan because the tomatoes will lay better and cook quicker. Turn up oven temp to 400 degrees. Slice tomatoes and place on paper towels to drain/dry to remove as much moisture as possible. Brush the bottom of the tart pan lightly with Dijon mustard, followed by basil pesto and Daiya cheese. Place tart in the oven for about 1 minute for cheese to melt slightly. 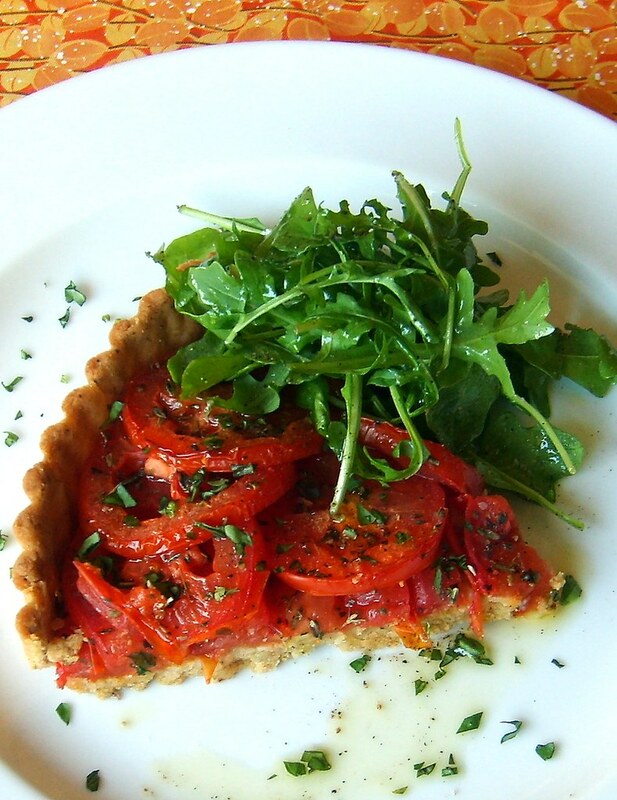 Remove tart from oven and starting from the edge overlap tomato slices until you get to the center of the tart. Sprinkle with Herbs de Provence and bake for about 10 minutes. After 10 minutes, turn tart and bake for another 10 minutes until tomatoes are starting to release their juices and are starting to shrivel. Remove tart from oven and let sit for about 10 minutes before removing from tart pan. Let cool completely before slicing and serve with a side salad of baby arugula dressed in a light lemon vinaigrette. PS, If you're ever in Portland (we have family who live there), go visit Bob's Red Mill, it's just outside the City. You can take tours and watch how they mill their flours, or wander around their large grocery store and purchase some of their products that are not available at Whole Foods. Also, their restaurant serves the best vegan pancakes I've ever tasted! I use to use Barbara's all purpose gluten free flour but found out it has dairy in it. It is a great flour though. I follow Karina the gluten free goddess, and make her flour mix. http://glutenfreegoddess.blogspot.com/ She doesn't like bean flavored flours. However, her mix is very starchy but always works for me. I also follow Simply gluten and sugar free and tried her flour mix which does contain fava/chickpea in the flour. http://simplysugarandglutenfree.com/ I tried it and wasn't a fan. I can't taste bean but something is off. I always wondered what grinding gluten free oats would taste like as flour? What do you think? Also check out prices at http://www.nutsonline.com/. Thanks for the gluten free links. I've been to glutenfreegoddess and I love her site; however I didn't see any recipes for tarts and so I thought that I would save money by purchasing Bob's Red Mill. I also checked out several books from the library and they seem to have "non-bean blends" and so I may try them as well. I've used oat flour before for making cookies and quick breads, along with spelt but it wasn't gluten free. I'll have to try adding some oat flour to one of the blends as well. I have a craving for a cinnamon coffee cake and so I may make a gluten free one today.